With its high-quality built and heavy-duty construction, BodyCraft SPX Club Indoor Cycling Bike is an ideal choice for your home as well as commercial purposes like in Fitness clubs. It has a durable solid steel frame, which is reinforced with 2 layers of powder coating to make it fairly resistant to corrosion. Integrated with 46 pounds of the precision balanced flywheel, it is further perimeter weighted to make this in-home indoor bike more stable, deliver high inertia and provide you with utmost security while cycling. Due to its Hutchinson V-ribbed automotive belt mechanism and German-made SKF sealed bearings; BodyCraft SPX Indoor Bike operates quietly, smoothly and delivers supreme performance. To ensure its exceptional durability and quality build, this Bike features stainless-steel seat post and handlebars that allow micro-adjustability, each having engraved scales for your suitability. Pedals are made from aluminum alloy and are incorporated with toe straps for better reliability. BodyCraft SPX Spin Bike comes with a Patented Friction-Brake type of resistance with micro-adjustable safety knob having emergency ‘Stop’ control.Its 3-piece Steel-made cranking system is cold-forged and the heat-treated axle spins are made from Cro-Moly steel. With its 300 pounds of maximum user weight capacity, this bike is perfect for highly intense training sessions. Optional Add-ons Additionally, you can also purchase different Accessories recommended by BodyCraft separately like SPD pedals, Computer that displays various workout metrics, Chest strap to measure Heart rate, Floor Mat for protecting the floor against sweat. To make this bike more versatile and functional in nature, you can choose any of the above given options. This product demands slight Assembly from the user and comes with required tools/instructions; you will have to assemble front and rear stabilizer, pedals, handlebar and its stem, seat and seat post as well as the 2 bottle cages. You can opt for ‘Expert Assembly’ from Amazon.com but this service needs additional charges. To download BodyCraft SPX Club Assembly & Owner’s Manual click here. As regards to its positive characteristics, this BodyCraft Bike is pretty sturdy and has a heavy-duty built frame that ensures high durability. The operation of the belt drive is quite noiseless, making it perfect for utilizing in homes. The Velo saddle is extremely comfortable and assures long-lasting use. Incorporated Safety Knob is within easy reach and allows precise adjustments. The best thing here is that the Emergency ‘Stop’ control comes handy whenever you want to immediately halt the cycling. Patented Friction-Brake resistance is smooth and heavyweight flywheel provides great stability. Hence, you can worry-freely use it for standup as well as seated cycling routines. Adjustable handlebar and seat accommodate most of the body sizes of users. 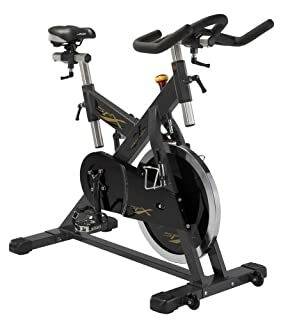 This Club-quality spin bike is a great value for money and perfect to be used for low-impact workouts, both by beginners as well as pro spinners. Concerning its negative aspects, BodyCraft SPX does not come with a Cycle Computer that designates your workout metrics, you have to buy this accessory separately which adds to the total cost. That’s not all, the optionally provided Computer provides heart rate readouts, but for that, you have to purchase separate chest strap as well. Also, it does come all included with SPD pedals; you have to purchase it separately if required. The total weight of the product seems to be quite heavy, so it might be strenuous for you to maneuver the product all by yourself. SPX Bike has pedals with just toe caging; you have to separately buy the clip-in type of toe straps if desired. Moreover, there are no markings provided that denote the resistance level of the bike, making it hard for the user to figure out its adjustment. Although it is not a very big deal, but the drive assembly has a plastic cover, which might be unlikeable for some users. BodyCraft SPX Indoor Cycling Spin Bike is a well-built, high-end and robustly designed gear that is perfect for low-impact cardio workouts. In terms of quality and durability, this bike comprises of some amazing power-packed features that deliver superior performance with quiet and smooth functioning. And so, this Club-quality Bike can be used in your homes as well. Due to high-quality materials utilized for the construction of this bike, you will experience a highly stable and equally durable usage of this bike. Handlebar and seat allowing micro-adjustments are like an additional bonus.